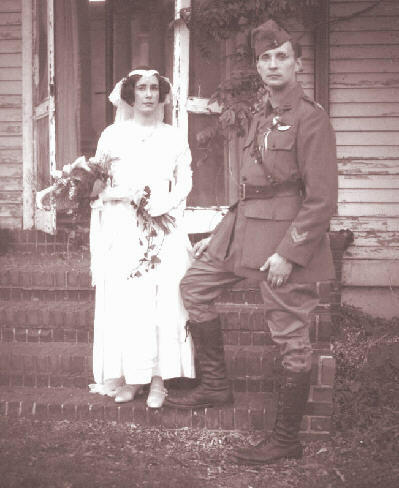 Warning 1 to Readers: The lovely bride wearing the wonderful ensemble and the dashing aviator in uniform did not really serve in the Great War. More details below. By way of background, Laurie and I were married on 5/25/1919 (1996). The location is the Wisteriahurst Mansion in Holyoke, MA. At the time of our “1919 Returning War Hero’s Wedding” the mansion would have been owned by Belle Skinner, the daughter of a famous MA textile baron. She received the French Legion of Honor for helping to restore the village of Hattonchatel at the end of the war. A real World War I veteran, Frank Sinkoski, from the Yankee Division was our guest at the wedding. It was the Yankee Division that recaptured the village that Belle paid to restore. Frank passed away in 1999, but he did live long enough to be awarded the Legion of Honor on December 29, 1998. As most of our friends were reenactors, history buffs, or vintage dancers, we had a live band perform period music as well. The dress was designed and sewn by historian and vintage dancer Sue Fischer. She has recently published a translation of Freifrau von Richthofen's diary. Sue made it as a gift to Laurie, as they had known each other for years. In fact, it was because of Sue and her husband, Steve, that Laurie and I met at a 1919 suffragette ball in 1994. Sue has made numerous dresses and other vintage clothing for people over the years. (We also hired her to do some poppy stencil work in our dining room.) She really is a talented artist, with a good feel for historic fashion and furnishings. Laurie says that the dress is Sue's own design, based on dresses of the era. It is ivory silk chiffon over silk satin with hand beading at the neckline, train and hem. Laurie wanted to be able to wear it as a dance dress, so Sue made it so that the train could be hooked up in the back of the dress. Don't know how many hours she spent, but I'm sure it was a lot!! !